I’ve come to an end of for the required readings in the epistemology course. I found myself still a little lost, so I decided I needed to read a book on Social Science research that covered the variety of epistemologies and put them into some sense of context. I found that I had several quotes from Crotty’s “The Foundations of Social Science Research: Meaning and perspectives in the research process”, so I decided to start reading it. In the first chapter, Crotty describes the research process in two ways. He first talks about the four elements that go into a research proposal. Specifically, Epistemology => Theoretical Perspective => Methodology => Method. I had seen this before, and was quite comfortable with it, and yet I was finding that it wasn’t working for me. I didn’t like the idea of having to choose an epistemology and having that inform my methods and methodology. That just doesn’t make sense to me! Reading further, Crotty states: “Not too many of us embark on a piece of social research with epistemology as our starting point … We typically start with a real-life issue that needs to be addressed, a problem that needs to be solved, a question that needs to be answered.” (p.13) Crotty then goes on to stay that the research question informs the methods, which inform the methodology, which informs the theoretical perspective, which informs the epistemology. The process is more like a deconstruction of the research question. Some might also call this a bottom-up approach rather than a top-down approach. Whatever you call it, this approach makes more sense to me. After drafting a research proposal for scholarships, and reflecting upon the process, I concluded that I needed to start with the research question. Once I have the question, I then need to ask myself, how do I answer the question? 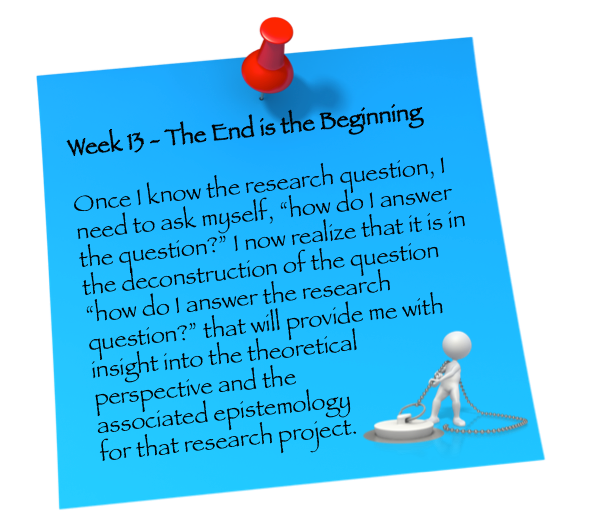 I now realize that it is the deconstruction of this question, that is the question “how do I answer the research question?”, that will provide me with insight into the theoretical perspective and the associated epistemology for that research project. It isn’t that “I” have a specific world-view, it is that each of my research projects will need to take a specific world-view. For me, this is what epistemological diversity is all about. Crotty, M. (1998). Introduction: The research process. In The foundations of social research: Meaning and perspective in the research process (Vol. The foundations of social research, pp. 1-17). Thousand Oaks, CA: Sage Publications.